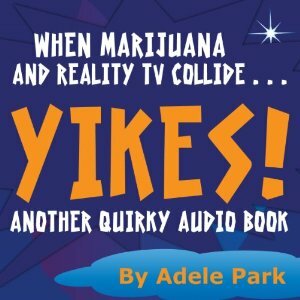 A very warm welcome to Adele Park, who's here to write about her very original Quirky Audio Book series. I have a quirky sense of humor. So much so that I lather the quirk on every audio book I produce. Writing on the fringes has its benefits: no one expects me to be normal. I see it as an opportunity to unleash a litany of snarky comments on social issues. The sell lines for both my audio books put a fine point on this: When radio and polygamy collide… Jitters - A Quirky Little Audio Book and When marijuana and reality TV collide… Yikes! Another Quirky Audio Book. Those who aren't amused by stuff like pot and polygamy might want to look elsewhere. Being free to roam about the cabin of craziness has led to the genesis of some pretty wacky characters. I like to place them in a secluded spot called Navel and see what happens. Navel is more of a state of mind than a physical location. It is a cosmic portal which opens to those in need, starting with Joseph Stratton, the kindly polygamist who founded Navel in 1957. Stratton, along with a gaggle of pubescent wives, was fleeing his religious brethren in Salt Lake City when he stumbled into the wild orange groves of Pitt County. Jitters and Yikes! both feature full casts of actors who advance the plot using first person narratives. Most of the characters are supreme narcissists who give lopsided accounts of what is happening. It's up to the listener to decide what is true. Having wandered off the literary reserve, I also take advantage of the chance to experiment with different forms of narration. From a writing perspective, narration is a convenient way to string together an array of random ideas. In the Quirky Audio Book Series, it also serves as the voice for the town of Navel. 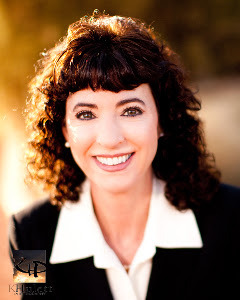 In Jitters - A Quirky Little Audio Book, the story centers on a shock jock named Nancy Neptune who unwittingly finds herself working at a radio station in Navel. In keeping with the radio theme, Jitters is narrated through a series of newscasts. Yikes! Another Quirky Audio Book offers a more conventional form of narration through a succession of pieces called Examine Our Navel. The protagonist in Yikes! is a marijuana enthusiast named Blue McKenna. Using satire, I explore issues ranging from gay rights to freedom of religion. By exploiting the absurd, I try to illustrate the effect certain attitudes and acts of discrimination have on society. But mostly, I'm just going for the grins and giggles. You can find out more about Adele, including where to buy the audio books, at the Yikes! website and on her blog.